The problems of human life know no bound. But we are resolving the problems easily and aptly. Long ago, diseases like cholera, chickenpox and typhoid used to take a heavy toll on human health causing indiscriminate death of people. We have been able to make the diseases subservient to us. With the advancement of medical science, the death toll due to the above fatal diseases has come down to almost zero level. Public awareness about cholera and diarrhoea has reached to what an extent that even a layman knows the use of oral saline as initial treatment of it. But most of the people are ignorant of the problems of arsenic and their solution. So, they should be made aware in this regard. We achieved country’s independence through nine months of war against Pakistan in 1971. Nothing is impossible for us. I hope the experts will be able to save people from arsenic. In 1993, we first came to know about existence of arsenic in our country. The issue got extensive coverage in the print and electronic media. After a certain point of time, people forgot the issue. But the deterioration of the situation prompted the policymakers and others concerned to rethink about arsenic problem. We need to continue awareness campaign. Experts of the whole world including Bangladesh are working on arsenic menace. Arsenic persists not only in water but also in fruits, rice and coconuts. So, people will have drink pure water from various sources including deep tube well and fruits as suggested by the experts to get rid of this problem. In 2000, arsenic came to the fore of discussion and later the issue was lost in oblivion. Basically, arsenic diseases are waterborne. The affected people live in the interior areas. Most of them are day labourers. They have to keep body and soul together with little income. As they work hard and have a dry throat, they quench their thirst drinking any water they find. They are not concerned as to whether the water is contaminated with arsenic or not. Although the government took a step in the past, it started to ignore the issue gradually. Following a report of a rights organisation, the government is moved again to deal with arsenic. The government is set to take a mega project to eliminate the arsenic problem. But mere initiating project is not enough. Success of the project depends on its implementation. If effective steps cannot be taken right now, arsenic will pose a serious threat to the nation. Arsenic is a chemical element. All kinds of water contain little arsenic. When the level of arsenic exceeds permitted level in any water, its users got affected and fell various complications. The sickness gradually deteriorates if not treated properly. The Department of Public Health Engineering has been working on arsenic issue since 1999. We have already installed 210,000 tube-wells. The work for installation of another 190,000 tube-wells is underway. If arsenic contamination in any area comes to our notice, we take steps to ensure pure water to the people of that locality. The government allocates tube-wells and public representatives distribute those among common people in their respective areas. The public representatives are knowledgeable as to where tube-wells are needed. 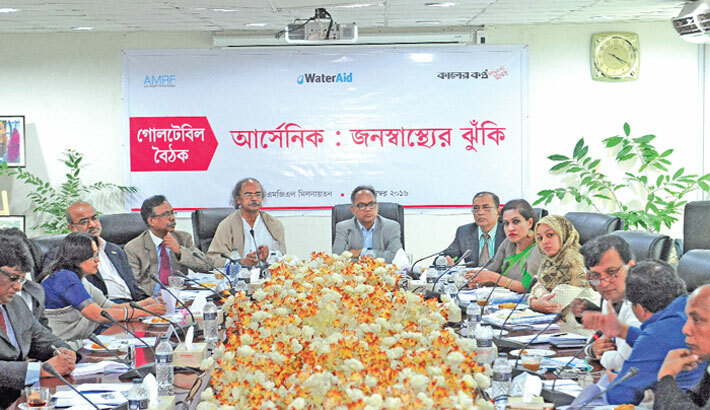 A survey of 2003 showed that water of 66.45 percent of the tube-wells in Munshiganj got arsenic contaminated. We took step to replace those tube-wells to ensure safety of the people. Besides, we are trying to supply pure water to the affected villagers through pipelines. We got the replaced tube-wells tested by BUET experts and those were found to be arsenic-free. Arsenic can be found anywhere. It acts as the poison in the drinking water if excessive amount of arsenic is available there. We have made widespread publicity on arsenic when it was first detected in the drinking water of the country. The government also has taken various steps on the basis of the amount of arsenic. The awareness among the people has declined to some extent after 2003. From the government side, we have been trying to provide arsenic free drinking water from the very beginning. We have also informed people different ways that how they will use arsenic free water. Now we have to be aware whether our tube-well water is safe or not. If the water is not safe then we have to avoid it. No matter the distance is, we have to collect the safe water. The government has designed some projects to address the arsenic issue. It is hoped that we will get safe water within 2020. We have to device a two-pronged strategy to ensure arsenic-free water. One of them is to utilise rain water, deep tube-well and surface water such as pond water. And the other way is to make water arsenic-free. Water contaminated with arsenic could be made safe to drink in various ways. In Bangladesh, we have more than 10 million tube-wells -- most of them are shallow tube-wells. Of them, 29 per cent are contaminated with arsenic. So, if we popularise the process of making water arsenic-free, we will be able to ensure safe water for all those people who have access to tube-wells. But instead, we look for shortcut, which is to go for deep tube-well. It is as if safe drinking water is not possible without deep tube-wells. Why our initiatives for making water arsenic-free have so far failed to produce tangible results? The main reason for this is the ineffective use of water purifying filters at household levels and Reverse Osmosis or Sitco plants at community level. Filters are being distributed at households through several NGOs, but many don’t know how to use the filter. They don’t know when different parts of the filter need to be changed. Some of them even don’t know whether the filtered water is actually safe or not. They may follow the proper usage of the water purifier as long as an NGO asked them to do. After that these filters are not used properly. So, there is a need for monitoring the usage of filters at household level. The same problem is hurting the Sitco projects at community level. So after installation of Sitco plants, their follow-up maintenance is crucial. Arsenic Mitigation and Research Foundation (AMRF) is working in Munshiganj to tackle arsenic problem. I have been involved in this project since its inception and I noticed that there are two types of people. One type of people lives in their ancestral lands, but a majority of them are away from their home. And then there are those who lost their homes to river erosion, and came here in search of job. Munshiganj’s Lohojong is one of the most arsenic affected areas. From my first hand experience I can tell that many villagers don’t know whether their tube-well is free of arsenic or not. They don’t know to what extent arsenic is tolerable to human body. Blind consumption of unsafe water is slow poisoning them. While conducting research on arsenic contamination in ground water I noticed that in the beginning we used to go to various programmes to create awareness against arsenic. But then there was lull in such activities. And now we are witnessing a renewed interest in arranging discussion meetings on arsenic and creating awareness against it. It has once again brought the matter to the fore, which is positive. Groundwater is very much important for the world, especially for Bangladesh. After finding arsenic on the groundwater in the country, there was a debate whether the water should be used or not. But, a total of 75 percent crop cultivation is dependent on groundwater. That’s why groundwater is an invaluable asset for our country. Arsenic is omnipresent but it poses danger when it goes beyond tolerable level. The tolerance level for arsenic has changed several times and it is now 50PPM in Bangladesh. Research and survey on arsenic have been conducted since the day when we found arsenic in Chapainawabganj for the first time. At that time, 50PPM arsenic was found in almost 36 percent tube-well. The degree of arsenic was a little bit low in hilly areas whereas it was high in Southern areas. However, the testing process of tube-wells came to an abrupt halt in 2003. Since then, so many new tube-wells have been installed across the country. Are these tube-wells arsenic free? We need to raise people’s awareness about it. The word ‘safe water’ sounds easy but the entire matter is very much complex to me. Whenever I drink water, a question arises in my mind – is the water safe to drink? We are trying to make people aware of safe drinking water in line with the government’s policy. During my official duty in Meherpur, we found arsenic in one place but did not find any sign of it just 100 feet away from that location. It is safe to install tube-well where there is no arsenic. I have seen a village where arsenic contamination is widespread and a huge number of people are being affected by it. Arsenic works slowly and people hardly understand that they were infected by this deadly poison. If someone consumes 125 ml Arsenic at a time s/he will die instantly. Creating awareness among the people is the key to combating arsenic problem. Usually women collect water in every family, so they should be more aware about arsenic. Regular check up of the tube-wells is also important, because arsenic free tube-well may also get contaminated by arsenic later on. Besides, it is wise not to use ground water from the arsenic prone areas. The government has taken a couple of projects to free people from arsenic problem. Arsenicosis is not a contagious or genetic disease. If more than 0.05 miligram arsenic is found in the water then it is considered harmful for the human health. Arsenic has been found in most of the areas of the country. People can be affected if they use the water where arsenic is prevalent. The study revealed that one person is affected per 1000 people. Country’s 63 percent women are affected by arsenicosis. The rural people are mostly suffering from arsenic contamination. Arsenic contamination causes harm to the human body. And the diagnosis of arsenic-induced diseases is also a big problem. There are some medicines those can help people to live longer with such diseases but still these are not curable. There is a locality in Munshiganj where women have to bring drinking water from an area that is one and a half kilometres from her home. I am a physician. I was in the scene where the first arsenic patient was identified in 1993. Many people have worked on this issue that time. Different non-government organisations have also worked on the issue. But, the importance of the issue has reduced as arsenic problem decline. No major work was done in the last 10 years. But, can we be free from the arsenic problem? County’s NGOs are dependent on donor agencies. They have to do according to donor organisations’ prescription. Donor agencies are not eager to fund programmes on arsenic problem as it is not projected as a major issue. Now it is the time to pay attention to it. The government and the donor agencies have to work in an integrated and extensive way in combating the arsenic problem in the country. The media were active when the arsenic cases were first found. But the issue went out of media attention later due to backtrack of donor agencies and some controversy and confusion. Arsenic not only pollutes water but also poisons food cycle. That is why experts have to raise their voice regarding the health hazards of arsenic. The media will also focus more on the issue to help the country address this problem. Arsenic is no contagious disease. Arsenic remains in our control. Once some people died of arsenic-related diseases, now there is no such kind of news at our knowledge. But, it does not mean that there is no existence of arsenic in the country. Now, work on arsenic started freshly at both public and private levels. Fifty-nine percent people are dying from non-communicable disease like stoke, cancer and diabetes now. We have no list of deaths due to arsenic-related diseases what is why the arsenic issue getting less importance. However, in 2003, the number of arsenic affected people was 32,000, which stands at 70,000 in 2016. People are more aware now. We are working to address this issue. This situation is in our control. But more awareness is needed. The treatment is very easy. Arsenic has once again become a matter of concern for us. It was much alarming when the issue came to public widely first. We got nervous and started thinking that arsenic remains everywhere. Even, we drank water very cautiously. But, we almost forgot the matter as there has been less publicity to spread awareness about the issue. Now, some reports have showed the existence and risk of arsenic. Apart from women, children are being more vulnerable to arsenic contamination and experts are saying that arsenic hampers proper growth of children. It’s really a matter of concern. If the proper growth of our future generation faces obstacle, the development of future Bangladesh will be interrupted as they are the future leaders of the country. Arsenic spreads into children’s body from their mother. Of the total arsenic affected, 63 percent are women. Our capacity is limited. It is possible to prevent arsenic if the government increase budget on public health.